You must make reservations at least 5 minutes in advance of the time at North Box Restaurant. Franklin St. &amp; McAllister St.
Open 2 hours prior to all evening and Sunday Matinee performances only. Parking is available in several lots in the surrounding area. Please call lots for current hours and rates.Performing Arts Garage*Patrons dining in the Opera House may enter through the North Carriage entrance of the Opera House (adjacent to the War Memorial courtyard) up to two hours prior to curtain. For transit directions, visit 511.org or call 511. 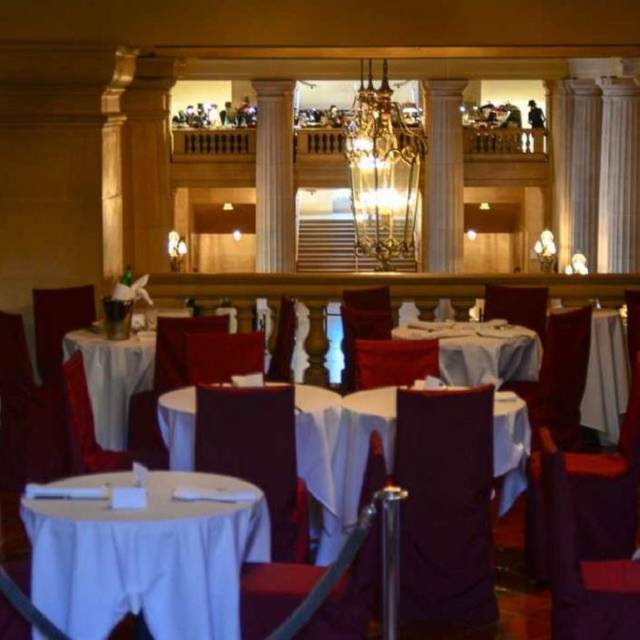 Located on the north mezzanine level of the historic War Memorial Opera House overlooking the magnificent main lobby, North Box Restaurant offers California cuisine with global influences, created using locally-sourced ingredients and serves as an ideal destination for pre-performance or intermission dining for any Ballet and Opera goer. Brandy, cointreau, chambord, rosé wine, lemon. Vodka, sweet and dry vermouth, chartreuse, orange bitters, orange peel. Items available during intermission. ^Nut free. I rarely go to a restaurant where I would say that the food was bad, but it was not good. The options were boring. The items tasted had minimal flavor/seasoning. Based on the building and location of the dining area I have to believe that there is no kitchen, hence the room temperature meal. The only entree option was a salad with protein. 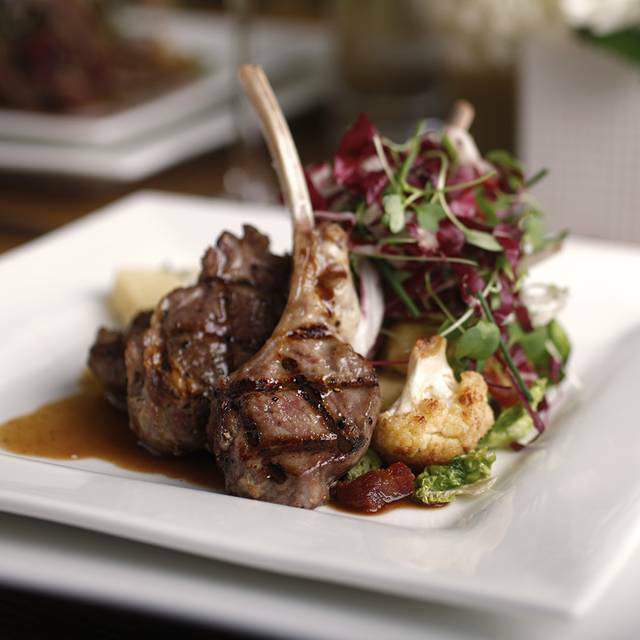 The photo of lamb chops on the website gives the impression that a more substantial meal is available. New management has made some changes, not all good. The cheese plate has less cheese and no dried fruit. The chocolate truffles are no more. Prices remain high. This is a great place to have dinner or desert along with the Ballet. Food is good and service is excellent. Expensive, but not considering the convenience and pleasant atmosphere. Natalie is the BEST!!!! She anticipates and provides everything that we could ever want or desire! Thank you! Food was great, Service a little slow. But highly recommend before Opera or Ballet. The best service! Food was delicious. Love coming back for dessert waiting for you at intermission. Crab cakes and market salad with tiny prawns both were very good and nicely presented. Waitperson was very personable and accommodating. Great service, our waiter Stephan (I believe) was very attentive, but not hovering. The choices were cold plates, very nicely constructed salads that were perfect portions for before the ballet. Nice selection of wine. Desserts were great, nice finish to the dinner. Ambiance was pleasant, not too loud given it was located very near a key route to the upper seating areas. Would definitely recommend and go back to in the future. Wonderfully convenient and amazing service. Our waitperson set up a larger table for us to enjoy during the intermissions with some friends who were not dining at the restaurant. When we arrived during the break water for all 6 awaited us, along with our unfinished bottle of wine from dinner. Really added to a lovely evening of music and ballet. THE NORTH BOX RESTAURANT IS A PLEASANT AND CONVENIENT PLACE FOR A PRE-PERFORMANCE LIGHT MEAL, AND WE LIKE TO COME BACK HERE. Wanting a lighter dinner and possibly dessert, this is a good choice. Menu items are limited, but suited to having a show after. Nice wine and drink menu. Salads were very good as was dessert. Make sure to have your ticket ready to show at the door as you need it to get into the building. You don't have to be seeing a show in that building, just one of the close venues. Very limited menu choices and pricey for what you get. Its ideal for a light and lovely little sometin, sometin before the performance. The new limited menu is sadly lacking, the food at best is mediocre, as is the service. Patina, the previous provider was excellent. It is sad to see that the new regime has totally dropped the ball. Service was a problem; the restaurant appeared to be understaffed. Although what we had to eat was good, the menu is too limited. The price is too high for what you get. A very nice alternative for dinner before the symphony! Best value at the Opera House. Keep your table for intermissions services for free. Great servers. Thanks! Delicious light dinner of a lovely head of butter lettuce spread open like a lotus with a tasty dressing and a side of fish. Good choices of wine and champagne. Just right. Great service, adequate food, nice and easy for a pre-ballet lunch and intermission treats. The biggest plus for the North Box restaurant is the convenience of the location for dining/drinking before the performance and during intermission(s). You are however, paying a premium price for that convenience. We ate lunch before a Saturday matinee. The menu is limited. We ordered the kale salad. The portion of the kale salad was very small for $17. I was expecting an entree-size portion. The salad was tasty but not over the top. We added chicken (and extra $7) which was flavorful and moist. Even with the chicken we were still hungry after the salads. We observed the green goddess salad which looked more plentiful. We had the panna cotta dessert which was different but very good. Brut or wine are nice to have but pretty pricy. The nice thing is they will keep it cold for you so you can return to your table to finish during intermission. They changed the glasses, napkins and utensils in between; a classy touch. For the matinee the North Box doesn't open until 1:00 PM for a 2:00 PM performance. We felt rushed to eat our meal. It was fun to overlook the floor below but the temperature in the restaurant was stifling - hot air rises. Overall the service was attentive. Our waiter had everything ready for us when we arrived back at the table during intermission. I miss the charcuterie plate offering they had in the past. Please bring it back! It was a great accompaniment to the cheese plate! The best thing about this site is that you can return at intermission for dessert! My husband and I each had a salad with added protein. For me, it was MORE than enough. For him, he was still hungry. Our daughter (13) had the cheese and fruit platter - she was THRILLED!!! Don't go expecting a gourmet meal. That isn't what North Box is about. It's about convenience so, with that in mind, it's the perfect spot for a snack before the performance. A bit of advice, order your dessert(s) before the performance starts so it's waiting for you when you make your way to your table at intermission. And - remember, the table is yours for the entire performance when you reserve it ahead of time. For us, this is why we reserve at North Box. It makes going to the ballet feel really decadent and is a much more relaxed way of doing it from start to finish. I think the new menu is too limited, and preferred the menu when Patina had the food contract at the Opera House. The current operators discontinued serving non alcoholic beer which Patina had available. The service is good, and it is a great place to grab a bite and/ or drink if attending the Opera or Ballet both of which we do. the location is the only thing that reccomends this place, as the food and service are deplorable. on par with a Dennys, but that is an insult tothem. stay away! The food was sub-par. The salmon was not fresh, the dark meat had flavored the entire fillet with an old "fishy" taste. The avocado on the salad was black, having been set out way before being served. It was also mushy and flavorless. The $3.00 bread was 4 pieces of dry, cold un-remarkable French baguette and the butter was frozen and could not be spread. Luckily the lettuce was fresh. I would expect this location and type of restaurant to be pricey. Fair enough. But I cannot understand why the food was so bad. Surely with the prices charged, the management could come up with fresh food...or change the menu to reflect what is possible in that limited space. I noticed whole plates of food untouched at other tables where the diners had finished. I can surely understand why. It was fun to eat at the Opera House before the performance, but pricey for what you get. There shouldn't be a minimum price. Not all people are hungry and we ended up wasting money and food. Otherwise, it was good (chicken a bit dry on the salad). The location of the North Box cannot be beat; it's quieter there than downstairs. Having a table along the balcony wall is fabulous and it's perfect timing before a performance with the option of pre-ordering for intermission. It's a lovely way to accompany a performance at the Opera House. Would love to have a few more choices on the menu though our salads were very nice. Haven't tried all the desserts yet; the panna cotta was nice; the cookie platter was sorely lacking. Service is outstanding!!! It’s pricey but expected for being in the same building as the performance. Small menu but what we ordered was tasty. Cheese plate was tasty, they did not skimp on the cheese. Had the arugula salad and the squash was yummy. Totally worth paying extra for the chicken because the portion was big. Was pleasantly surprised that with a reservation for dinner, we actually had the table for the whole performance. Preordered after dinner drinks and dessert for intermission. It was so convenient! We were there for the Nutcracker and there were quite a few kids. Definitely kid friendly and has a kid menu. Not good. Went for lunch to enjoy the festive atmosphere of the Opera House prior to San Francisco Ballet's incredible production of the Nutcracker and was completely disappointed. That space deserves better. With three salads, raw beef poke, and no main courses, the menu is non-existent. The service is slow. You will be better off pretty much at any other place around the Opera. The North Box Restaurant is very convenient. The menu is quite small with mostly salads. I had the Wedge with Chicken and it was really good and plentiful. The presentation was very nice as well. The wait staff was very attentive and we had a very good overall experience. This year's menu is a big step down from last year's menu. with mixed seafood, veggies, and greens, or a Cobb salad, or a chicken salad. vegetables and nuts. The added chicken portion is too large and too expensive. The added prawns are few in number and very expensive. Service is very good. In sync with many other reviews in regards to the new caterer... in a nutshell:Overpriced, extremely limited menu with so/so food, mostly friendly waitstaff in a convenient setting. I have been attending the Opera as a season ticket holder for quite a few years and dined here often. I have tried the new caterer twice: 1st experience: we had a very nice(but overpriced) pasta dish and a salad (no bread was offered) which us 2 ladies split...experience was ok..
Last(&final) experience: Walked up to register where Hostess was going over menu and taking an order from a couple at the register while 3 waitstaff stood behind chatting. So I went to my table(with my name on it) where she made a point to track me down and reprimand me publicly(in a rude and nasty tone) about not sitting down without checking with her. I suggested this was a sit down venue and perhaps she should have had the couple sit down and send one of the 3 waitstaff to take their order...she was not happy! We soon placed our order for a split salad and asked if we could have bread. Our waiter was friendly and took the order then returned with our wine. Eventually our salad showed up (after 3 other later arrivals were 1/2 through their meal) and it was the wrong salad. The quality of the salad was just ok ( $17 for a Green Goddess(mostly lettuce) and addtl $7 to add some chicken. The bread was horrible! Stale and dry(as if purchased in a plastic bag a day or 2 ago) Later that night we both had stomach issues. So ..recap: As with other diners: Spend your money on one of the many wonderful restaurants within 2 blocks of the opera house. Do not ruin your evening by starting out with bad/overpriced food. This a basically an expensive cold food snack bar. We went because it is convenient before the opera, however the service was so slow that we were late to our seats! And all we had were salads, cheese and wine. Won’t be going there again. Arrive early and go to a real restaurant. My salad had that "crunchy" unclean/dirt texture. They provided another, but it was the same. The waiter was very nice about it and very apologetic. He was great. However, it is important that restaurants clean the lettuce properly, especially with all the problems that could happen. Pre Opera, just the right amount of food! Servers and all the staff are fantastic! I was not impressed, we'll probably not go there again. Please bring back the Seafood Chopped Salad and Opera Cake for desert. Food was tasty, but some odd cardboard tasting bits -even in the desert- which I am sure are healthy for me, but not appealing- were not necessary. And be sure to eat lunch before, if this is your dinner meal. Best reasons to eat in North Box are the stellar service and the convenience.